Often we live a certain lifestyle because we believe it is socially acceptable to do so. What if we broke away from these societal expectations and allowed ourselves the freedom to live a unique life? Living an unconventional lifestyle is allowing yourself the freedom to play as a child does. You take the time to question conventions as customs change every generation. You can choose to live as a Time Traveler would, taking the elements you enjoy from each time era. Our manner of dress, the complexity of our lifestyle, how we spend our time, the food we eat, and our vocational choices are just some of the ways we can design our lifestyle. We may have temporary circumstances that are unpleasant. What matters is that we have our focus on outcomes that we want to achieve. Play the cards you’re dealt to maximize your possibilities. Choose your own adventure, and express your life as an art-form, because you have the power to design your life. Going to parties or clubs every Friday & Saturday night. This timer killer can set the tone for the remainder of your life. Often the weekend is the only time that a young adult or teen may develop their entrepreneurial skills or work toward their dream. While others are “living it up”, you can be “living your dream” as you work on your craft. Signing up your kids for more than one activity at a time. Checking Facebook, email or Twitter too often. Driving to the grocery store every time you run out of an ingredient rather than creativity looking for a substitute recipe or meal. Heavy PTA or excessive volunteer work (unless this is your primary calling in life). Ask Yourself: “Why do I always eat lunch at my desk in the office?” Perhaps you want to appear like your serious about your work. You may also have so much to do that taking time away for lunch and breaks may seem like a waste of time. Quality sleep and planned breaks help us to be significantly more productive. When it’s time to work, give it your all, yet when brakes arrive use the time to go on a walk or work on your long term dreams. Perhaps you can write ideas in your laptop or hardbound journal. Once you have clarified expectations others will no longer expect you to eat at your desk during your breaks. One of the most obvious ways to break away from the conventional way of life is to deliberately choose costuming from a different time era, ditching societal norms. Other benefits of choosing a niche wardrobe include: a simpler wardrobe, more timeless pieces and avoiding keeping up with the Joneses. Often these pieces of clothing may receive grand complements and will be conversation starters. Interestingly enough, you may save money because your avoiding fashion fads. There is no need to replace the item once it becomes outdated, only discard when well-worn.What’s stopping you from dressing Steampunk, Renaissance or like a Mountaineer? Why do I dress this way? Do I really need to follow the latest fashions or can I express myself in a timeless way? Often we assume that because we have been given a physical gift we must hold on to it throughout our lifetime. Do you have a habit of making impulse buys every time you visit the outdoor mall? Take a moment to look at your surroundings with new eyes, would you like your home to feel more like a beach resort or bed and breakfast? As with fashion, following diet trends will leave your eating rituals in a state of flux. One day the egg is declared unhealthy and loaded with cholesterol, the next it’s praised as a super-food. The best way to approach dieting is to eat primarily “real” unprocessed food. Minimizing man altered edibles. We also know that it’s acceptable to allow yourself to feel hungry from time to time as intermittent “fasting” cleanses the body and aids in weight loss. Yet if this method does not work for you by all means find an eating ritual that you find to be healthy and sustainable. A diet should be a lifestyle rather than something you participate in a few times per year. It has been assumed that collage is the absolute pathway to success. Yet the crushing weight of student loan debt coupled with unprecedented access to knowledge, makes the college pathway seem less desirable for more people each each year. Ask Yourself Serious Questions Regarding Your Chosen Vocation. Was it to make lots of money, a hot job at the moment or something you fell into? Stop and read 48 Days to the Work You Love or What Color is Your Parachute to help you discover your true vocation. Having a job to “pay the bills” is noble indeed, yet make sure you’re heading in the direction of your dream job. Remember the Tortoise and the Hare, while the hare is squandering his time you can be making headway toward the goal line. Today choosing to be a Career Homemaker has become an extreme lifestyle choice, yet it is extremely practical when you subtract the cost of daycare, a second car and eating out. Now spend a few minutes and ask yourself a few questions: Is there an area of your life that you would like to be more unconventionally creative in? 1)The way you spend your time? Say “no” to secret time wasters and mindfully schedule in time for your lifetime dreams. 3)The way you decorate or “un-decorate”? Clear spaces make homes appear more elegant without additional cost! You will also enjoy more serenity. 4)Schooling? Perhaps you wish to home-school or avoid getting into debt with college. The article “Don’t Send Your Kids to College” by James Altucher touches on some of the reasons why college is a debt trap. 5)Unconventional Diet? Fads come and go. Stick with a diet that speaks to you personally. 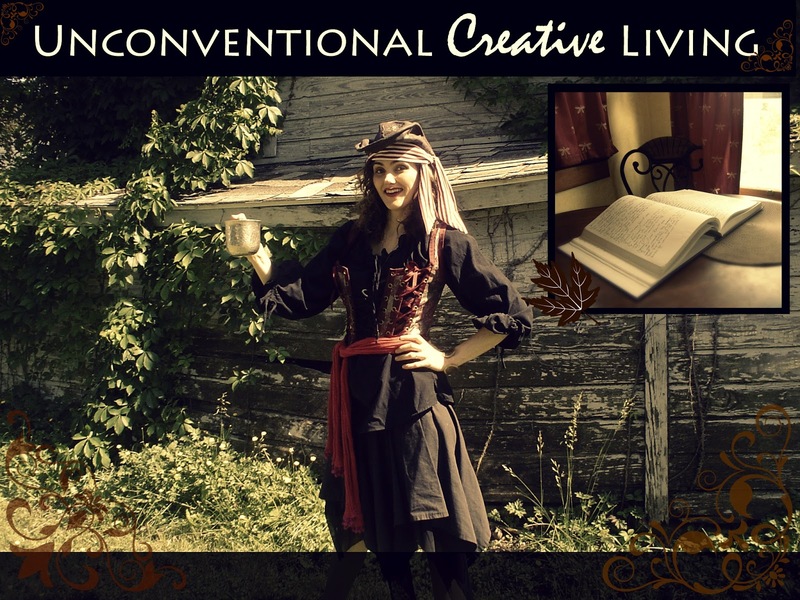 It does take bravery to live unconventionally. You are choosing to be “mindful” in how you dress, spend your time & decorate your home when choosing a life of unconventional conventional creativity. You are sculpting your time and your life. Michael Hyatt wrote the article: How to Better Control Your Time by Designing Your Ideal Week, which has great insight into how much control we have over our lives. If we do not decide how to spend our time, life will “just happen” to us. You can change course at any moment, embarking on a journey to your ideal life!